* ward boundary changes as presented by INGOG (approved by all 4 commissioners) ... had passed preliminary vote about 6 weeks ago and cleared the review process with no citizen complaints. * deny sales and/or consumption of beer or alcohol (event or other) outside confines of private establishment of "Grey Beards" during 2nd annual Hogs "N" Rods Car & Bike Show in regards to event area. 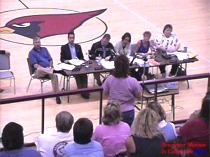 * ... establish parameters related to the event area for sale and/or consumption of beer during the 2nd annual Hogs "N" Hot Rods Car and Bike Show on June14, 2003 (Commissioner Gross' motion was seconded and approved by Commissioners Gross, Sallee, and Rogers, with Commissioner Porter voting no) ... following another time-limited citizen discussion both for and against. The parameters discussed were railroad tracks west to 10th (not side streets ... and only the north side of street ... unless congestion forced using south side also).